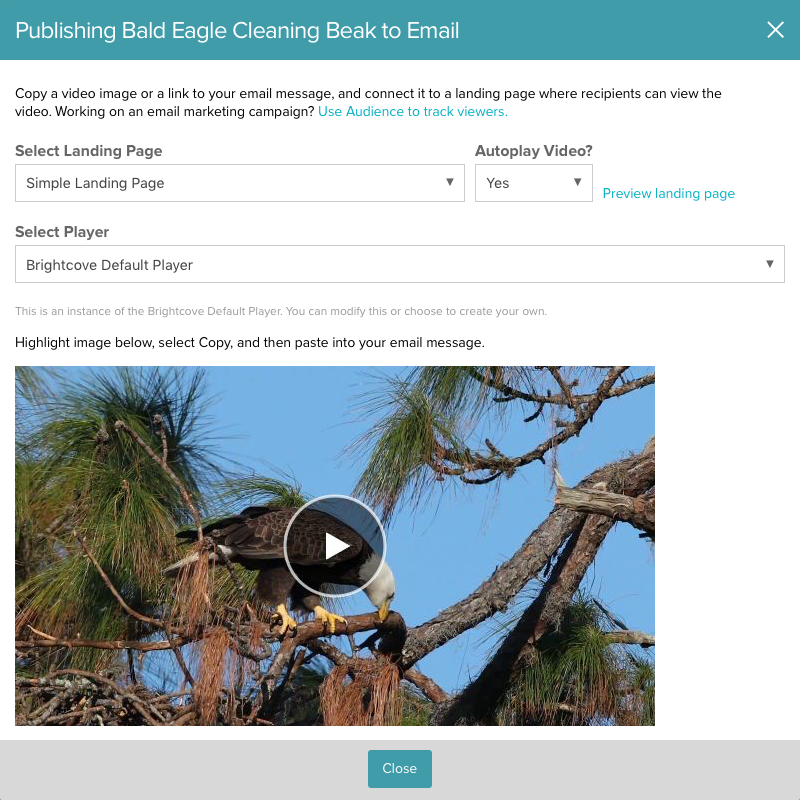 This topic provides an overview of how to publish a video to email using the Media module. On most platforms, embedding videos directly into email isn’t possible. This isn't a Brightcove limitation, nearly every modern email system will strip out video player embed code due to security reasons. You can however, drive awareness and traffic for content by creating an email with some teaser text and a poster image. The Media module provides the ability to publish a video to an email landing page. Note: For another option on emailing videos that provides more control over the appearance of the video poster image and uses a custom landing page, see Driving Video Views Through Email. Click Publish and Embed > Email Landing Page. Select a landing page. The dropdown list will contain a Simple Landing Page which is a system provided, unstyled sample landing page. The list will also contain any published landing page experiences that were created using the Gallery module. Using a Gallery landing page provides more flexibility over the appearance and styling of the landing page. Lead forms can also be used to capture viewer information. For more information on creating Gallery landing pages, see Creating a Landing Page Experience. Note: The poster image will be sized to 640 x 360. Select to Autoplay Video. This option is only available when selecting the Simple Landing Page. Select a video player. This option is only available when selecting the Simple Landing Page. For Gallery landing pages, the player is assigned as part of the experience properties. (Optional) Click the Preview landing page link to preview the landing page. Highlight the image, copy it to the clipboard and then paste into an email message. Click Generate Short Link to generate a shortened link that can also be used and distributed. When the email is received, clicking on the poster image or short link will open the video in a browser tab. If a Gallery landing page is used with a lead form, the lead form data can be downloaded using the inside the Audience module. For information, see Exporting Gallery Lead Data.